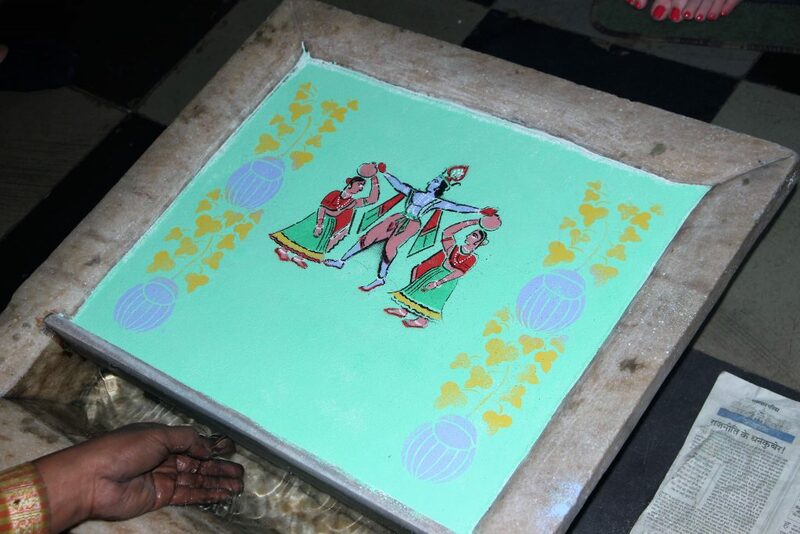 Jal Sanjhi, the art of painting on water, is kept alive by just one family in Udaipur, Rajasthan. With a canvas of water rather than paper or cloth, they’ve been practicing the art of Jal Sanjhi for generations. Every painting depicts only one subject: the Hindu god, Krishna. On a bustling lane in the old city of Udaipur, my guide, Singh, tells me we’re here. 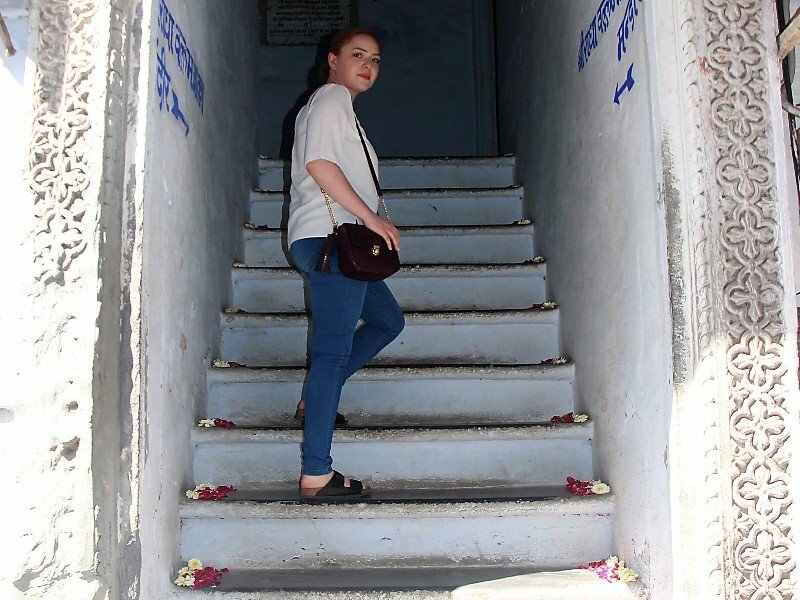 We climb a narrow staircase and enter the Radha Vallabh temple. Here, I am introduced to Rajesh Pancholi, the Jal Sanjhi artist. “From the birth of Krishna to the destruction of Kansa, our themes have always been the legend of Krishna,” explains Rajesh. To begin the art of Jal Sanjhi, water is placed in a flat vessel and sprinkled with various secret ingredients to create a floating base. Rajesh explains that the water is first boiled, to ensure its pure (this is, after all, a form of worship). Boiling the water also creates a better surface to paint on, he adds. Next, Rajesh pulls out a pile of incredibly old looking papers. These are original stencils that his father and forefathers have used over the past 200 years. The stencils are incredibly delicate and detailed. 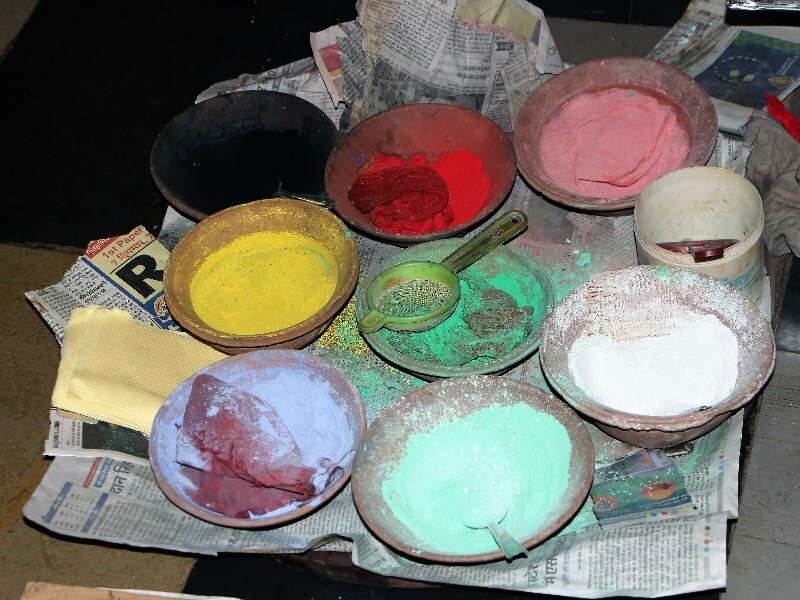 Rajesh has a palette of coloured powders in front of him: black, red, pink, white, green, blue and yellow. 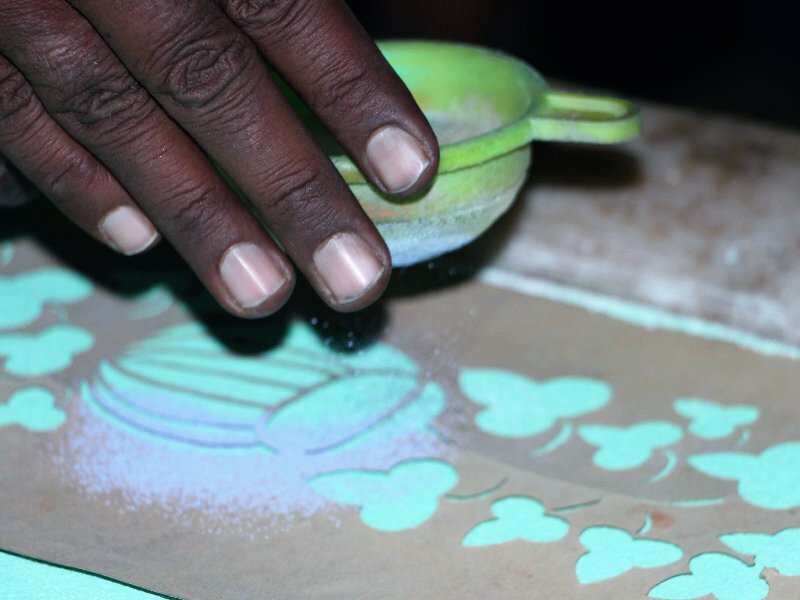 To create one painting, the artist will use a number of stencils that depict different colours. He carefully selects his first colour, transfers a spoonful into his decanter, and continues to tap it gently over the floating canvas. The artist explains that the hand should be not too close as to build too much pressure on the water, but not too far either. Now for the really tricky bit: removing the stencil. Rajesh very carefully lifts either corner to remove the stencil without damaging the water. He then places his next stencil. The stencils are perfectly matched up on the painting by a series of markers at either corner. He repeats the process with more colours, and more stencils. The work becomes increasingly difficult as the weight of more colours is added. The artist invited me (Madeleine Hann, co-founder) to give it a go. It is much harder than it looks! Removing that last stencil, much to Rajesh’s amusement I barely let out a breath! Jal Sanjhi was originally performed using natural colours sourced from vegetables. Modern, chemical colours have proved to be a setback for this rare art. 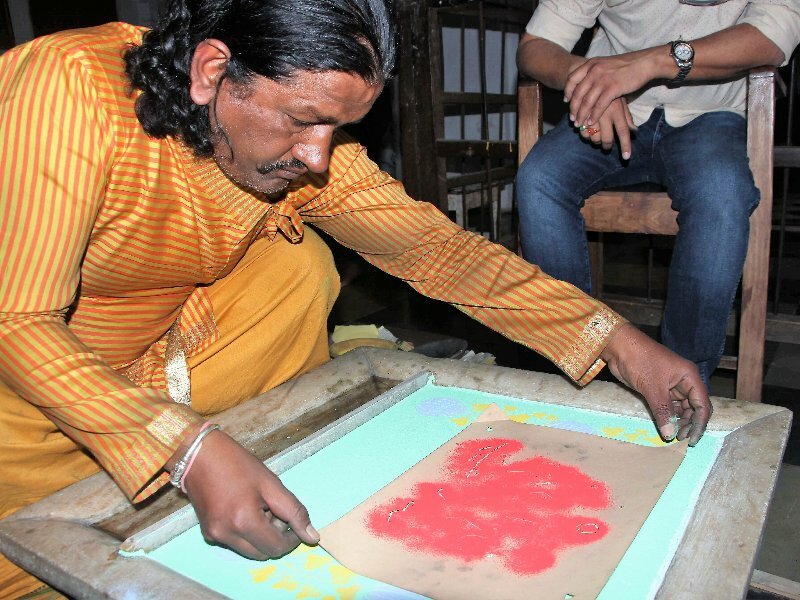 “Nowadays, colours have a lot of chemicals in them that creates a lot of problem because unlike natural colours, these chemical colours don’t always float on water and, if they sink, they destroy the painting,” says Rajesh. 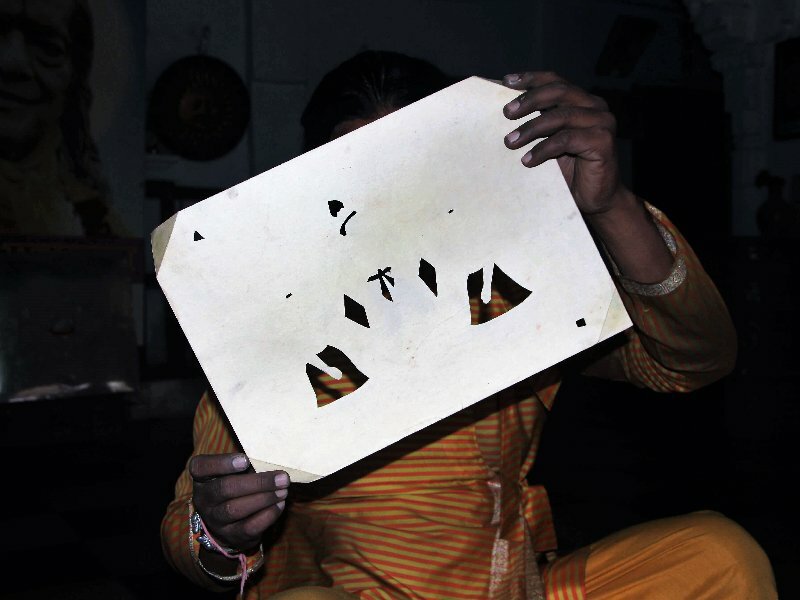 When the piece is finished, Rajesh dips his hand into the water causing the artwork to ripple. He tells me that each painting lasts a maximum of a day, before the powders sink and the piece is ruined. He adds that the art is performed in the temple on special religious occasions. It is a dying craft, though this family intend to keep it alive and Rajesh’s nephew is currently being trained to one day take over. Despite this, Rajesh fears that the craft is not lucrative enough to support future generations. If you’d like to escape the beaten track and experience something a bit different in Udaipur, please do get in touch. We’d be delighted to include a visit to Rajesh’s temple, to experience his Jal Sanjhi art first-hand, on your upcoming trip to Rajasthan.